I have another new book! My collection of patisserie books is rapidly expanding and the list of things I want to bake is increasing faster than I can make them. This new book is Patisserie Maison by Richard Bertinet, a well known French chef that is highly regarded for the bread and patisserie that he produces. Richard Bertinet runs his own cookery school in Bath, called the Bertinet Kitchen and I have been told by Annemarie Barrett from Miele, that the Patisserie Course he runs is definitely worth attending. Something else for me to save up for! The layout and design of Patisserie Maison is visually appealing and the collection of recipes is exceptionally well thought out. There are basic recipes that would wow guests, and can be made quickly or prepared in advance, along with more technical recipes that are made up of a number of components. The base recipes for things like genoise, creams etc all feature a number of suggestions for different flavour combinations, inviting you to create your own recipes. Why did I choose eclairs? Well, it’s been a while since I attempted choux, I’m always happy to try another chef’s recipe for my nemesis and I was also inspired by the eclairs produced at Fauchon. Fauchon is a French Patisserie known for their eclairs, every year they have an eclair week at their flagship store in Paris where they produce one off eclairs made to their exacting standards. 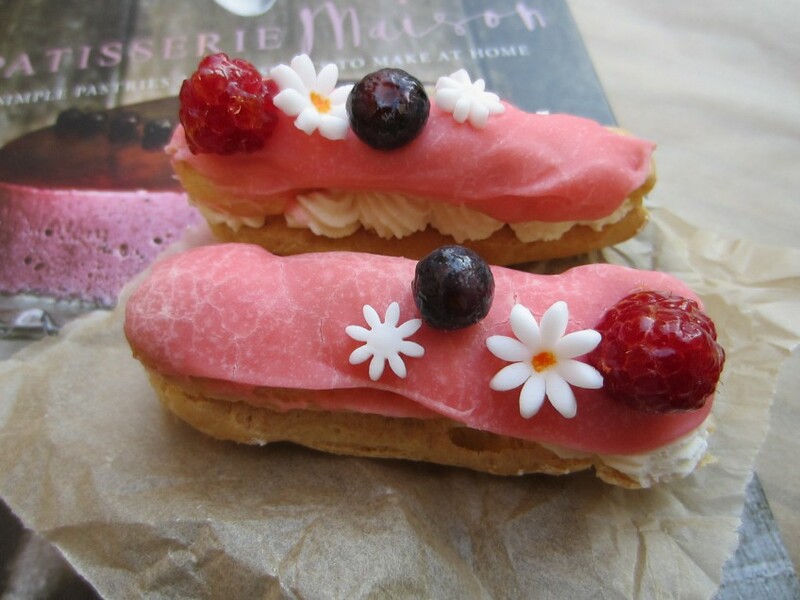 I decided to use Fauchon’s styling as the inspiration to decorate my eclairs, as you can see, they’re not as elegant as those made by Fauchon, but I did try my best. 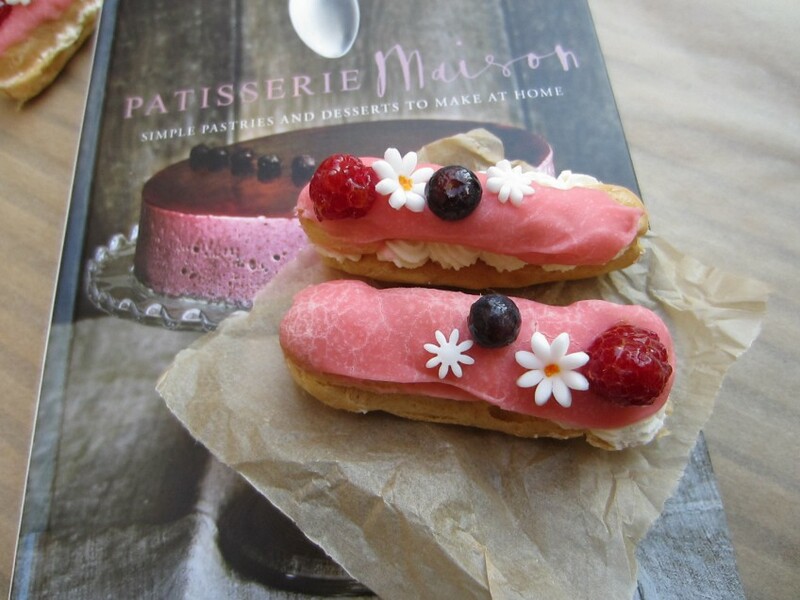 This eclair recipe is the first thing I have attempted from Patisserie Maison, but I also have my eye on the blackcurrant mousse on the front cover. After struggling to get hold of any blackcurrants, I have managed to acquire some and I will be featuring the recipe soon on my blog. The word eclair means ‘Flash of lightening’ in French which apparently is a reference to how quickly they are eaten, because they are gone in a flash. This choux recipe is one of the best I’ve used, it provided the perfect consistency and gave me plenty of pastry, the texture was very thick and it made the pastry much easier to pipe. Patisserie Maison has lots of pictures to accompany each stage of making the choux pastry and the other pastries featured in the book, so you can be sure that you have the correct texture, the pictures are very reassuring especially if you are new to any of these techniques. The recipe in Patisserie Maison suggested filling the eclairs with chantilly cream, I added a little French brandy to the cream (this was a deviation from Bertinet’s recipe) to make it even more luxurious. The eclair is then topped with fondant icing that has been heated and had food colouring added. I decided to decorate these eclairs further and a day before making the eclairs I used these daisy cutters to stamp out 24 medium and 24 small daisies from the leftover white royal icing. I used a mix of yellow powdered food colouring and alcohol (gin) to paint a dot inside the larger daisy. I left these to air dry overnight so that they would harden. I also glazed some raspberries and blueberries with apricot jam, so that they would shine on top of the eclair. This is a recipe for the classic eclair, topped with a fondant icing and decorated with glazed fruit. Begin by making the choux pastry, combine the water and butter in a pan and bring to a boil. Sift the flour into a bowl and tip this into the boiling water and butter. Take the pan off the heat and beat the flour, until it resembles scrambled eggs. Place the pan back on the heat and beat the paste for 2-3 minutes until the dough dries out. Tip the mixture into a food mixer and using the paddle attachment, add the eggs one at a time, until they are fully incorporated. The dough should be thick and sticky, this means it is ready for piping. Preheat the oven to 190 degrees and line two baking trays with greaseproof paper. To aid with the piping of the eclairs, you can draw 12 lines 8cm long on the greaseproof paper on each tray, make sure they are spaced well apart, turn the paper over and pipe on the reverse. Using a piping bag with a 1cm tip, fill it with the pastry and pipe 12 lines on each sheet of paper. Put the eclairs in the oven for 20 mins, then for a further 4 mins cook the eclairs with the door open a little to let out the moisture. The eclairs are done when they are a golden colour and feel hard to the touch. To make the chantilly cream, sift the icing sugar into the cream, add the vanilla extract and whip the cream until stiff enough to pipe it, then add the rum and give it a final whip. Place the cream in the fridge until you're ready to use it. Next combine the apricot jam and water in a pan and heat until the jam thins. Using a pastry brush, glaze 24 raspberries and 24 blueberries and lay them on a piece of greaseproof paper. Cut all of the eclairs in half lengthways and using a star shaped piping nozzle, pipe cream on to the bottom half of the eclairs. Add the fondant icing and water to a pan and heat gently, beat the mixture so that the icing and the water become mixed together. Then add some food colouring and stir so that the fondant becomes a nice shade of pink. Dip the tops of the eclair in the fondant icing and then place them on top of the cream. 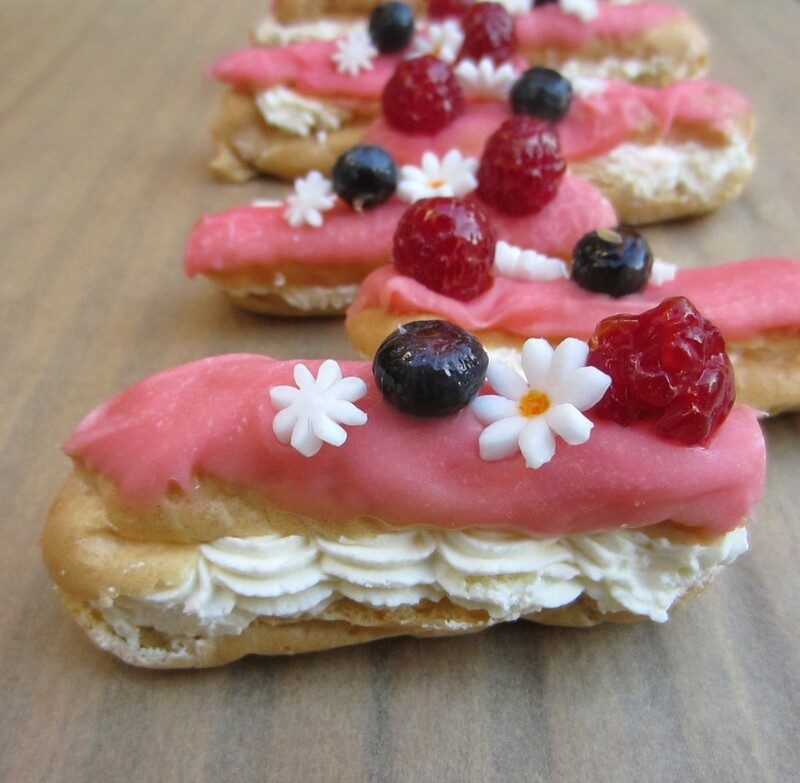 Sit a raspberry and a blueberry on top of each eclair. If the fondant in the pan starts to set, return it to the heat to loosen it again. The eclairs can be stored in the fridge, but they should be eaten as soon as possible because the cream will soften them. I will be featuring more recipes from Patisserie Maison on the blog over the coming weeks, but if you’re looking to try patisserie using recipes that aren’t too daunting, I suggest you give this book a try and what better way to do that, than by entering my giveaway to win a copy of Patisserie Maison. This competition is open to entrants from outside of the UK. I need to practice my choux! I want to get better at it. I’m definitely going to give these another try, with a different filling and icing combo. Keep practicing. I think eclairs are going to be big soon! I love brownies! I want to make more eclairs now, I just worry that repeating things on the blog will get dull, but I can only eat so much cake. I’ll need to try them at some point though. I have an eclair phobia! I made them once for my baking club and they were very tasty but certainly not great in the looks department. Unlike yours which look simply too pretty to eat. I suppose it is a fear I must conquer – baking club’s theme this month is Patisserie. Can I send you as me? The biggest problem I find with choux is that once you’ve piped it, that’s it! It’ll cook in that shape, so you have to be really confident what size you want them etc. Also a lot of cookery books really underestimate the cooking time and they end up sinking. I read an interesting recipe in Edd Kimbers new book and he leave the choux in the oven (switched off) after the cooking time for 30 mins, this would help to dry it out. I’m going to give eclairs a go again trying that method. You’re in a baking club too? How do you do it? I’ve seen your macarons, you can do patisserie and you’ll be fine. Yes the shape you pipe is exaggerated when baked so any flaws are magnified! I do believe Edd is actually meant to be coming to that baking club meet. I shall hide in a corner somewhere. But good idea about macarons – haven’t made any in ages. The piping element does terrify me. You could make a giant macaron cake like I did, they’re pretty impressive looking. Wow Edd’s going to be there? I am so jealous! Don’t hide too much, pick his brains! 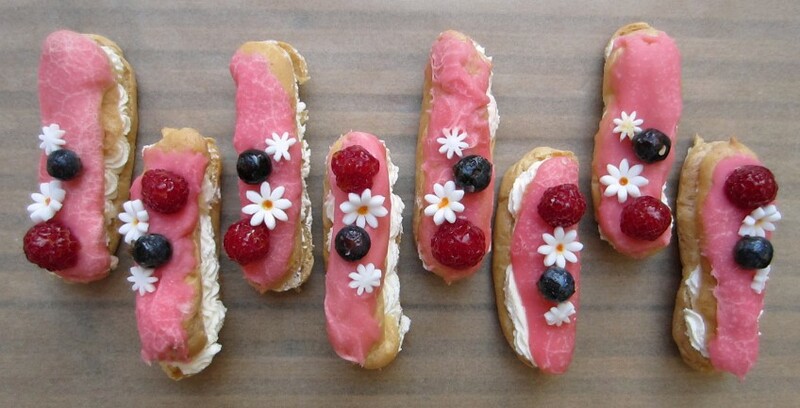 I do love eclairs and these look amazing. You’re so creative with the decorating, the daisies are a nice touch. 🙂 So glad this choux recipe worked out for you Angela, you’ll be a complete pro at it one day. Thanks Jodie. This giveaway is open worldwide, so you can enter this one 🙂 I intend to persevere with choux and after something I’ve learnt tonight, I need to trust my instincts, rather than follow the recipes to the letter! I’ve really enjoyed working with choux pastry lately (including a mid-sized croquembouche), but there’s lots of other French patisserie I’d like to get my teeth into (physically and metaphorically). That looks beautiful Kate. Is it decorated with lavender or cacao nibs? Lovely photo. Sorry – should have said! The choux buns are a mix of vanilla, chocolate and lavender crème patissière, with lavender over the top. A little messy, in hindsight, but it was delicious! Wow, what was the lavender creme patissiere like? did you infuse the milk with real lavender? OR did you use an essence/extract? It was the winner of the trio for me – so delicious. I infused the milk with real lavender – not for too long (trying to avoid the potential soapiness), only about three minutes after taking it off the heat. I had the same concerns when I made something with rose a few weeks ago. As long as it’s delicate, it tastes amazing. The piping is the only tough bit. Good Luck on the giveaway. I’ve never tried making anything with choux so I’d love to try to make some profiteroles! Or these eclairs! choux is a temperamental beast (well it is for me), definitely give it a go though, it’s good to learn new things. Good Luck. I made this last night- beautiful out of the pan, then I let it cool and put in a mason jar. I put it in the fridge and the next day it was totally crlzatlyised. Help!! What happened? Hi, what part of the recipe did you make that crystallised in a jar? I’m not quite sure which part of the recipe you’re referring to. yes, it’s a sort of miniature croquembouche and it does look doable. I always think they look pretty decorated with a spun sugar nest and sprinkled rose petals. Well your English seems very good to me. There are so many pictures in this book, as long as you can read the ingredients and you have some baking knowledge (which I know you do), you’ll be able to work from this. Good Luck! Oh Anne they’re delicious. So worth the effort. Choux buns with streusel topping are a nice alternative to profiteroles. I know what you mean about wanting to bake everything! Ooh, that’s a lovely idea! I know what I’ll be doing today! Éclairs, one of the few sweet treats I like, if the book is anything like dough or crust then it will be a prize well with winning. I will have to check these out, you’re the second person to recommend them. Good Luck! I got the ‘pastry’ book from the library and whilst it was good, there wasn’t much in it that I didn’t have in my other books. Not a criticism of the book, but I didn’t end up baking anything from it. Richard Bertinet’s books are always excellent: thorough and very easy to follow. His kneading technique in “Crust” and “Dough” is unique. Can’t recommend them enough to anyone interested in baking. I’ll have to check them out Lee, my bread is a bit hit and miss. I really recommend Dan Lepard as well for bread making. Choux is my nemesis at the moment too, just so many slightly different recipes (I have 17+ different ones collected now) that it gets rather confusing. I’m determined to learn though. I think I’m even more in love with eclairs than macarons right now. I know just what you mean Vicki, the annoying thing about a blog is that it’s all about the visuals though, although for me it is taste that wins you over ever time. I’m still not done with choux, I need to practice it much more. The recipes are so approachable, it’s a lovely book and the specialist equipment needed is minimal. A great book. Thanks Melanie, they are delicious and so many variations! I’ve heard that they are quite easy to make so really want to give them a go. I am always game to increase my pastry skills! Cronuts are on my to try list, perhaps for the upcoming holidays. I’ve been thinking of trying cronuts, the original recipe was posted online recently as the guy behind them is bringing out a recipe book! They are so good, you should definitely make them! I would love to make a croquembouche! But I’ve not made much choux before, so I have a bit of practicing to do first! Me too Liam, but I’m still getting to grips with choux as well. How interesting, this post is right up your street then! I am seriously obsessed with eclairs at the moment! I’m positive they’re going to be the next big thing!!! I totally agree Becki, choux is such a blank canvas, there is so much you can do with it. Fusion eclairs are the next big thing! Tiramisu eclair, lemon meringue eclair, paris brest eclair etc! I’m so excited by this!! There are so many flavour options! I like your tiramisu idea!!! Love your strawberry icing there. I would like to try to make a croquembouche! I would love to create coffee eclaires or choux – filled with fresh whipped ceam and smothered in a coffee flavoured icing! coffee works so well with choux. Perfect combination, good shout. Thanks Tracey. Yes cream horns, are they puff pastry? I only remember them from my childhood, you don’t really see them anymore, a bit like lardy cake. I’d definitely like to try eclairs. 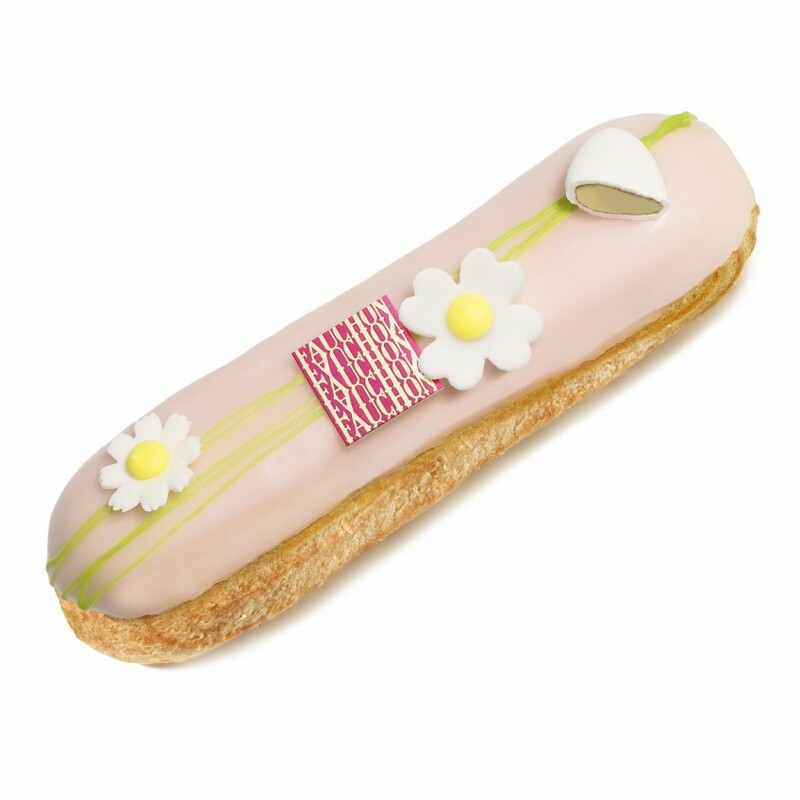 I had some really interesting tea flavoured eclairs in Paris recently and they were amazing. My favourite was gemaicha flavoured! I have the new William & Suzue Curley patisserie book and there is so much green tea in there I am going to have to embrace it. I’m wary, because I’m not entirely sure I actually like green tea. I do like jasmine tea though. I think eclairs are where it’s at and I want to start perfecting them properly! Green tea tastes completely different in patisserie then it does as a drink so you may be surprised. I’d love to read posts on green tea patisserie as I’d like to give it a go but I’m a bit nervous. Green tea and jasmine eclairs would be amazing! I love floral flavours too. I’ll give it a go then Jaye. They seem to use a lot of Matcha.There is a recipe for Matcha Eclairs in the book too. I can’t remember what the filling is. Matcha eclairs are lovely! You won’t need to get the top quality stuff as lower grades are good enough for cooking. They aren’t as bright green though. That way if you aren’t keen it’s not so bad as higher grades are quite pricey. I can’t wait to see what you make. Thanks Jaye, that’s really helpful. I shall certainly be in touch when I need some buying advice.